An opposition politician who was charged with terrorism this week has sought asylum in a foreign country. In a video message published on You Tube last night, Jumhooree Party (JP) council member Sobah Rasheed said he has obtained asylum in an unspecified foreign country, to avoid prosecution by President Abdulla Yameen’s adminsitration. Sobah, the Adhaalath Party president Sheikh Imran Abdulla and JP’s deputy leader Ameen Ibrahim are accused of inciting violence at a historic anti-government protest on May 1. If convicted under the 1990 Anti-Terrorism Act, the three face between 10 and 15 years in jail. Nearly 20,000 protesters took to the streets on May Day, demanding the release of ex-president Mohamed Nasheed and ex-defence minister Mohamed Nazim, whose arrests sparked the ongoing political crisis. Sobah pledged to launch an international campaign seeking sanctions against President Yameen’s government. He said he will inform the international community of Yameen’s tyranny, corruption and prosecution of political leaders, as well as the businesses who prop up the government. He also said he would reveal details of those who murdered ruling party MP Afrasheem Ali in 2012. Sobah pledged to continue his campaign until the government releases Nasheed and Nazim from jail, and stops targeting JP leader Gasim Ibrahim’s businesses. Sheikh Imran has denied charges at a first hearing on Sunday. Sobah and Ameen’s trials were set to begin on Sunday, but were cancelled as they are out of the country. Gasim has been in Bangkok since late April. The criminal court has reportedly issued an arrest warrant for Gasim for a charge of funding the May Day protest. The tax authority in May froze Gasim’s Villa Group’s accounts claiming the company owed the government US$90.4million in unpaid rent, fees and fines. Gasim insists the claim is unlawful and is contesting it at the civil court. The main opposition Maldivian Democratic Party (MDP) chairperson Ali Waheed was also arrested on May 1, but the PG office has reportedly not made a decision on prosecuting the former MP. The terrorism charges follow President Yameen’s invitation for separate talks with the three allied opposition parties. Imran, Ameen, and Ali Waheed are among the representatives of their respective parties. The May Day demonstration was the largest anti-government protest in Maldivian history. Riot police cracked down on the demonstration with tear gas, pepper spray and baton charges after protesters attempted to enter Malé’s restricted Republic Square at dusk. Nearly 200 people were arrested and scores of protesters and some police officers were injured during violent clashes. The terrorism charges against Sheikh Imran also comes after President Yameen threatened to prosecute the religious conservative party’s leader over allegations linking the president to the murder of Dr.Afrasheem. The opposition has called for a third mass protest on June 12. The criminal court has ruled tonight to keep the president of the Adhaalath Party, Sheikh Imran Abdulla, in police custody until a verdict is issued in a terrorism trial. 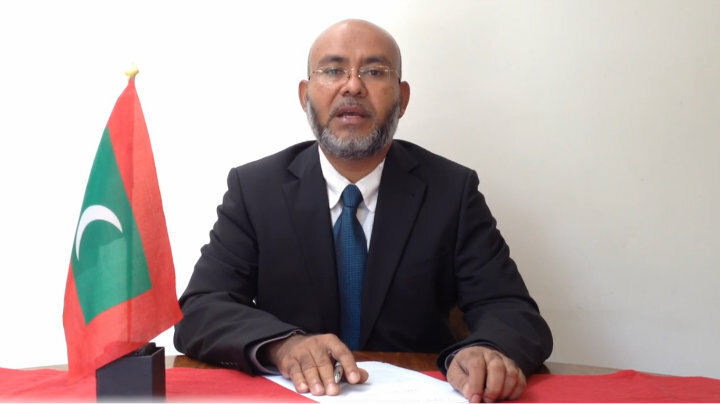 Sheikh Imran is charged under the 1990 Anti-Terrorism Act with threatening to harm police officers and inciting violence at a historic antigovernment protest on May 1. Imran has denied charges at the case’s first hearing tonight. The Prosecutor General has also filed the same charges against Jumhooree Party’s deputy leader Ameen Ibrahim and council member Sobah Rasheed. Hearings were scheduled for Ameen at 8:30pm and Sobah at 9:00pm tonight, but cancelled as the pair are out of the country. Imran is represented by lawyers Ali Zahir and former Attorney General Husnu Suood. Citing a secret police intelligence report, state prosecutors claimed Imran was a threat to society and requested the three-judge panel detain Imran until the end of his trial. Defence lawyers asked for five days to answer charges and requested Imran be kept under house arrest, noting the high court had last week overturned a May 17 criminal court order and transferred Imran from police custody to house arrest because of his diabetes. Judges Abdul Bari Yoosuf, Abdulla Didi and Sujau Usman rejected the request. They adjourned the hearing after saying Imran will be allowed time to answer charges, but did not specify the date for the next hearing. Imran was kept in cuffs throughout the hearing. He was arrested last night from his home on a criminal court warrant. The same three-judge panel overseeing Imran’s trial had sentenced ex-president Mohamed Nasheed to 13 years in jail on terrorism charges, relating to the arrest of a judge during his tenure. Foreign governments and international bodies, including the UN and Amnesty International, have criticized the trial for apparent lack of due process. Nasheed was not given adequate time to prepare defence, denied the opportunity to call defence witnesses and at times denied the opportunity to seek legal counsel, observers have noted. The three judges had also sentenced ex-defence minister Mohamed Nazim to 11 years in jail on weapons smuggling charges. Nasheed’s Maldivian Democratic Party (MDP) and the Adhaalath Party had allied after the ex-president and the ex-defence minister’s arrest. Imran had been at the forefront of the ‘Maldivians against tyranny’ campaign. 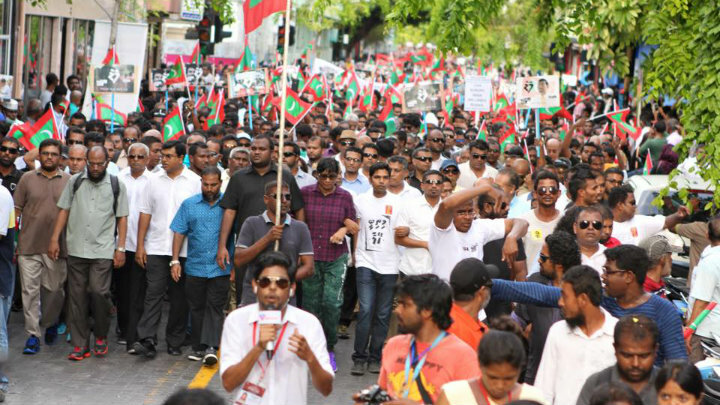 The May Day rally – the largest protest in Maldivian history – was the second mass protest staged by the opposition calling for Nasheed and Nazim’s release. Nearly 200 people were arrested from the May Day demonstration following a police crackdown after protesters attempted to enter the restricted Republic Square at dusk. Imran was arrested at 11:00pm on May 1 and held in police custody for 26 days. The criminal court authorized his release shortly after the high court ordered police to transfer Imran to house arrest. “I have never encouraged anyone to create unrest, fear, harm anyone, at any time,” he said on his release. The terrorism trials of opposition Adhaalath Party and Jumhoory Party (JP) leaders are set to begin at the Criminal Court tonight. Adhaalath Party president Sheikh Imran Abdulla’s trial is set for 8:00pm, while trials for JP deputy leader Ameen Ibrahim and council member Sobah Rasheed have been set for 8:30 pm and 9:00pm, respectively. The three are charged with inciting violence at a mass antigovernment protest on May 1. If convicted, they face between 10 and 15 years in jail. At tonight’s hearings, state prosecutors will read out charges against the three and judges are expected to give them a three-day period to appoint lawyers. Imran is in police custody at present. He was arrested from his home at 11:00pm last night on a criminal court warrant. “The warrant stated Imran should be brought to court tonight under police guard,” a police spokesperson said. A warrant is usually issued only if the accused repeatedly fails to attend court, or if the accused may abscond or flee from trial. The Adhaalath Party said Imran only found out about the hearing at the time of his arrest. It is not yet clear if a warrant has been issued for Ameen and Sobah’s arrest. The police declined to comment on the issue. The criminal court was not responding to calls at the time of going to press. Minivan News understands Imran, Ameen and Sobah are charged under Article 2 (f) of the 1990 Anti –Terrorism Act that states inciting fear and issuing threats to harm individuals or damage property is an act of terrorism. Imran and Ameen were arrested after the May Day protest and accused of encouraging violence in their speeches, which police contends led to protesters assaulting police officers, damaging property, and disrupting public order and safety. Sobah Rasheed was arrested from an opposition street protest on May 3. The police had also accused the opposition leaders of threatening President Abdulla Yameen and other senior government officials. The terrorism charges follow the president’s invitation for separate talks with the three allied opposition parties. Imran, Ameen, and Ali Waheed are among the representatives of their respective parties. Following his release last week after 26 days under police custody, Imran denied the allegations. More than 20,000 people took to the street on May 1 calling for the release of imprisoned former President Mohamed Nasheed and ex-defence minister Mohamed Nazim, whose arrests sparked the ongoing political crisis. The May Day demonstration was the largest anti-government protest in Maldivian history. Some 193 were arrested and scores were injured. Nasheed was charged with terrorism over the detention of a judge during his tenure and sentenced to 13 years in prison in March. Nazim was sentenced to 11 years in jail on weapons smuggling charges. The retired colonel maintains the weapons were planted at his home by rogue police officers. Foreign governments and international bodies including the UN criticized Nasheed and Nazim’s rushed trials for apparent lack of due process. The parliament of the European Union has called for Nasheed’s immediate release. The opposition alliance has meanwhile called for a mass protest on June 12. The terrorism charges against Sheikh Imran also comes after President Yameen threatened to prosecute the religious conservative party’s leader over allegations linking the president to the murder of MP Afrasheem Ali in October 2012. Adhaalath Party (AP) president Sheikh Imran Abdulla, Jumhooree Party (JP) deputy leader Ameen Ibrahim and JP council member Sobah Rasheed have been charged with terrorism for allegedly inciting violence during the May Day anti-government demonstration. The prosecutor general’s (PG) office reportedly filed the terrorism charges at the criminal court today. The charges under the 1990 Anti-Terrorism Act carry a sentence of between 10 to 15 years in prison. Imran and Ameen were arrested after the May Day protest and accused of encouraging violence in their speeches, which police contend led to protesters assaulting police officers, damaging property, and disrupting public order and safety. Main opposition Maldivian Democratic Party (MDP) chairperson Ali Waheed was also arrested on May 1, but the PG office has reportedly not made a decision on prosecuting the former MP. The terrorism charges follow President Abdulla Yameen’s invitation for separate talks with the three allied opposition parties. Imran, Ameen, and Ali Waheed are among the representatives of their respective parties. Following his release last week after 26 days under police custody, Imran denied the allegations of encouraging violence. The police had also accused the opposition leaders of threatening President Yameen and other senior government officials. The May Day demonstration was the largest anti-government protest in over a decade. The PG office has also filed terrorism charges against the driver of a pickup that broke through police lines during the May Day demonstration. The pickup used at the protest drove through barricades and the line of Specialist Operations police officers at high speed and was stopped near the Islamic centre. The police said at the time that the driver was instructed and paid by protest organisers to break through the police lines. Riot police cracked down on the May Day demonstration with tear gas, pepper spray and baton charges after protesters attempted to enter Malé’s restricted Republic Square at dusk. 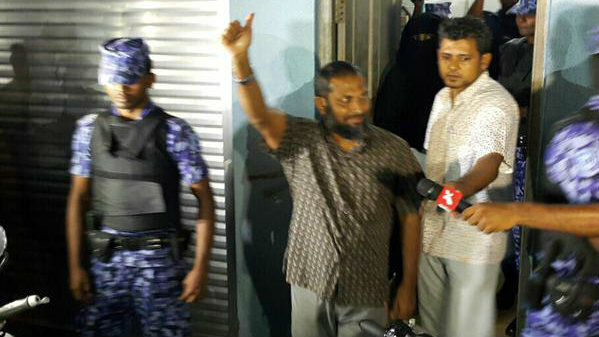 The opposition Jumhoree Party’s (JP) council member Sobah Rasheed has been released from police custody today. Sobah was arrested on May 3 on a charge of encouraging violence at the historic antigovernment protest on May Day. He was arrested from an opposition protest under a court warrant. The opposition is calling for the release of ex-president Mohamed Nasheed and ex-defence minister Mohamed Nazim. The JP’s deputy leader Ameen Ibrahim, the Adhaalath Party president Sheikh Imran Abdulla and the main opposition Maldivian Democratic Party (MDP) chairperson Ali Waheed were also arrested on the same charges. All have now been released from custody, but will face charges. Sobah and Imran spent 26 days in police custody. Waheed spent 24 and Ameen spent 14 days. The prosecutor general’s (PG) office has filed terrorism charges against the driver of a pickup that broke through police lines during the mass anti-government protest on May 1. The pickup used at the protest drove through barricades and the line of Specialist Operations (SO) police officers at high speed and was stopped near the Islamic centre. The police have also forwarded cases to the PG office against main opposition Maldivian Democratic Party (MDP) chairperson Ali Waheed, Adhaalath Party president Imran Abdulla, Jumhooree Party (JP) deputy leader Ameen Ibrahim, and JP senior member Sobah Rasheed. The PG office media official told Minivan News today that it has not determined whether to press charges against the opposition leaders. The leaders of the allied parties are accused of inciting violence in their speeches during the demonstration, which police contend led to protesters assaulting police officers, damaging property, and disrupting public order and safety. With the exception of Imran, the others had exercised the right to remain silent during the police interrogation. The three were arrested in the wake of the May Day protest, while Sobah Rasheed was arrested from a street protest on May 3. Imran, Ali Waheed remain in police custody after the criminal court extended their remand detention for a second time on Saturday. Ameen was released by the High Court last week after the appellate court overturned the criminal court’s 15-day remand detention order. The High Court, however, upheld the lower court’s order to hold Imran and Ali Waheed in custody. The pair has appealed the High Court’s ruling at the Supreme Court. Nearly 200 protesters were arrested in a police crackdown on the May Day demonstration after protesters attempted to enter Malé’s restricted Republic Square at dusk. The police have since banned the use of four-wheeled vehicles during street protests. According to local media, the PG office has not pressed charges against the driver’s wife and another protester on the pickup. The case against the driver was reportedly filed at the criminal court on Tuesday. Of the 193 protesters arrested on May 1, the PG office had previously said that cases of 98 protesters have been sent to the committee reviewing first time offenders. “That means we will press charges against only about 30 people. That includes repeated offenders and the people suspected of attacking police officers at the protest,” PG Muhthaz Muhsin told the press on Sunday. The pickup driver is the only protester facing terrorism charges, which carries a penalty of up to 15 years in prison. The other protester face charges of disobedience to order and obstruction of police duty. Scores of protesters and some police officers were injured during violent clashes on the night of May 1. Video footage shows protesters tripping and kicking an SO officer and one man hitting the policeman over the head with his baton. Some 14 people have since been arrested on suspicion of assaulting the officer, who was flown to Sri Lanka for medical treatment. On Tuesday, police appealed for public assistance in locating three more suspects: Abdulla Mufeed, Ahmed Miudhaan Hameed and Ahmed Unais. The MDP has accused police of torturing and threatening to kill three suspects arrested for assaulting the police officer. Other May Day detainees have also alleged that police beat them after their arrest from the protest, but police have denied the allegations and advised lawyers and families to file complaints at independent oversight bodies. The criminal court has extended the remand detention of opposition Jumhooree Party (JP) council member Sobah Rasheed by ten days. Sobah was arrested under a court warrant on May 3 from an opposition rally and held in police custody for 15 days. He is accused of inciting violence at a mass anti-government protest on May 1. The high court yesterday upheld the criminal court’s initial 15-day remand. The opposition has raised concern over what it calls unnecessary detention of opposition leaders, pointing out the constitution only allows the extension of remand if the accused is deemed a danger to society, if they may influence witnesses or might flee or if further interrogation is needed. The criminal court on Sunday extended the remand detention of Adhaalath Party president Sheikh Imran Abdulla and main opposition Maldivian Democratic Party chairperson Ali Waheed by 10 days and seven days, respectively. The two were arrested on May 1 on charges of inciting violence and held in police custody for 15 days. The High Court last week rejected appeals from the pair challenging the legality of the criminal court’s remand detention orders. Lawyers have filed a second appeal of the criminal court’s decision to extend remand detention. The two were brought to Medica hospital in Malé for treatment yesterday. Ali Waheed was also brought to ADK hospital last week for an MRI scan of his spine. The criminal court has ordered police to hold Jumhooree Party foreign and public relations executive Sobah Rasheed in remand detention for 15 days. 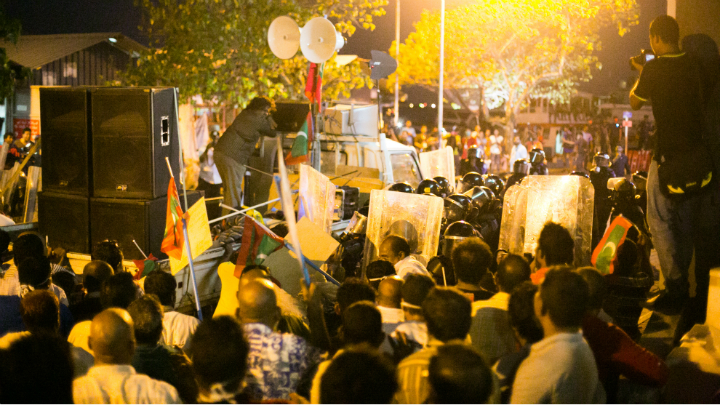 Rasheed was arrested from Sunday’s night opposition protest at the artificial beach. Police said he was arrested with a court warrant in connection with an ongoing investigation, but declined to reveal details. 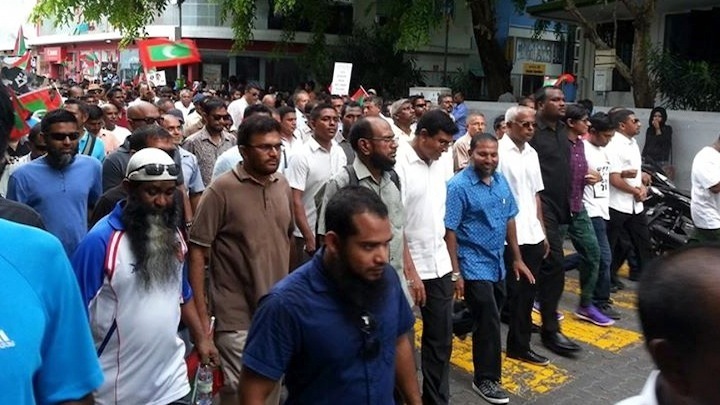 Leaders of the allied opposition parties, including Adhaalath Party president Sheikh Imran Abdulla, main opposition Maldivian Democratic Party (MDP) chairperson Ali Waheed, and JP deputy leader Ameen Ibrahim were arrested with court warrants after Friday’s anti-government mass rally. Nearly 200 protesters were arrested from the May Day protest after clashes with riot police, of which 175 are being held in remand detention for 15 days. Rasheed is also a member of the ‘Maldivians against tyranny’ alliance’s steering committee that organised Friday’s protest. A number of protesters, including former MDP vice presidential candidate Dr Musthafa Luthfy, was also arrested from Sunday night’s protest. However, Luthfy was released after a brief detention.